I have about one more week left before I go back to school, so right now I’m trying to get all my affairs in order. I’m waiting on all the textbooks that I’ve ordered off the internet, I’m going school supplies tomorrow, and I’m starting to get organized. I’m enjoying my last little bit of time off and dreading going back. I’m half way through law school now but already have senior-itis. I’m still majorly backed up on swatches because I had so much time during my winter break to swatch all of my untried polishes! I’m about 20 swatches behind at the moment, and that is kind of scary to admit! Today I have another polish from the recent Color Club fall collection that my lovely friend Lindsay sent me in our swap. She sent me a set of minis and 3 out of the 4 were duochromes! This one happens to be one of the many affordable versions of Chanel “Peridot” or a more accessible (now) version of OPI “Just Spotted the Lizard”. 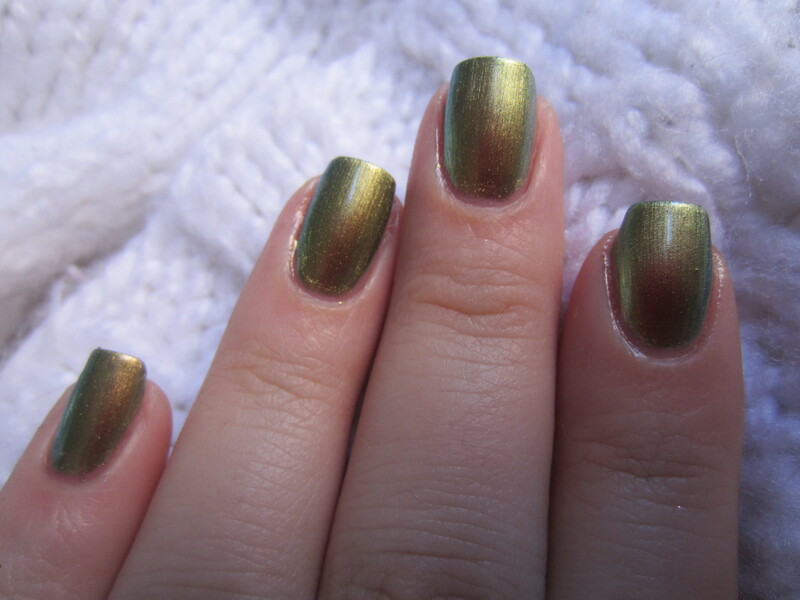 Color Club “Editorial” is a metallic duochrome that shifts from light green to gold. Like all the other Peridot dupes, the color shift is much stronger in the bottle than on the nail. But the color shift on this one seems much stronger than Peridot. I had to do comparison swatches to see if they really were the same, or if Editorial’s color shift was more vivid, so stay tuned to that post! The formula on this polish was just ok. The consistency was spot on and the brush made it really easy to apply. But the formula was a little streaky, which is kind of apparent when you’re indoors. It takes 2 coats to be completely opaque. The best part of this formula is that it dries very quickly. I like this polish, so if you don’t have the Chanel or OPI (or Jessica or Caprice, or one of the many others) version if this, this is a good alternative! What do you think of this polish? Do any of you have this or one of the many dupes? ← My Nail Polish Collection! i have a comparison post between this and peridot coming up soon! probably tomorrow! I have this color!!! Never knew it was a dupe for a Chanel polish. Too cool…I nominated your blog for the Liebster Award. You might already have more than 200 followers, but I still wanted to show you some blogger to blogger love! 🙂 Here’s the link.